Addictions are multifaceted, and the underlying causes of addiction are complex. But historically, a number of personality traits have been associated with developing an addiction. However, just because someone is predisposed to develop an addiction through genetics or personality traits does not necessarily mean they will become addicted. Other factors, such as environment and a support system, play a role. Addiction can be influenced by various factors in one’s life, including social environment, family, psychology, and biology. Personality, which reflects the confluence of a number of individual traits, is one of these factors. According to the National Institute on Drug Abuse, the role that both genetics and environment play in the development of addictions are unique and change over an individual’s lifespan. 2 This in turn makes it even more difficult to understand the underlying causes of addiction. Not everyone who has the traits will develop a substance abuse problem. Many worry that having these traits will lead to addiction. However, as mentioned above, many other factors influence the development of an addiction. Not everyone who has a set of traits or genes that predisposes them to addiction develops problems with substance abuse. Protective factors, such as a strong support network, an ability to handle life stressors, and resilience can prevent addiction. For example, someone who is sensation-seeking and impulsive may be more likely to engage in risk-taking activities, but may pick up sky-diving or mountain climbing instead of drugs. Conversely, someone who does not display any of these traits can develop an addiction. If you are worried you may develop an addiction, or if you know that addiction runs in your family, educate yourself on substance abuse and the risks of using. Learn to use coping skills when experiencing negative life events or emotions, and surround yourself with positive and sober people. Some of these traits show up in early childhood, while others may develop later in adolescence. Although not every adolescent who exhibits these traits will develop an addiction, it’s important to know the predictors so that drug abuse education and early intervention can be provided. According to the Substance Abuse and Mental Health Services Administration (SAMHSA), risk factors increase the likelihood of negative consequences later in life, while protective factors decrease the likelihood.9 Some risk and protective factors remain the same throughout a person’s life, and some are variable, depending on life circumstances. It should be noted that there are other factors at play, such as resiliency. Resiliency is one’s ability to overcome life events and maintain a positive well-being. More research needs to be done to determine what makes one child more likely to be resilient than another. However, some evidence suggests that all children can be resilient and grow up to be successful. Many different types of services are available to help people who have developed an addiction. Treatment programs can help people manage certain traits, such as impulsivity or neuroticism, that may be contributing to an addiction. Inpatient: Inpatient treatment options for addiction offer 24/7 support and are provided in a medical or residential setting. The length of time will vary depending on the person’s needs and his or her addiction, but typical stays can range from 30 days to 90 days. Outpatient: Outpatient programs are less intensive and allow the person to live at home while receiving recovery services. 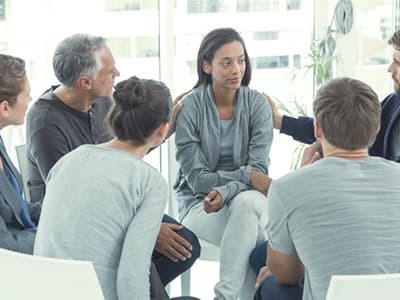 12-step programs: Support groups, such as Alcoholics Anonymous (AA) and Narcotics Anonymous (NA), provide a safe and supportive environment consisting of others in recovery. Level of intoxication and risk of withdrawal. Other behavioral, cognitive, or emotional conditions. Environmental factors such as family, peers and school.
. Ducci, F., & Goldman, D. (2012). The Genetic Basis of Addictive Disorders. The Psychiatric Clinics of North America, 35(2), 495-519.
. National Institute on Drug Abuse. (2016). Drug Facts: Genetics and Epigenetics of Addiction.
. Mitchell, M. R., & Potenza, M. N. (2014). Addictions and Personality Traits: Impulsivity and Related Constructs. Current Behavioral Neuroscience Reports, 1(1), 1-12.
. Kaiser, A. J., Milich, R., Lynam, D. R., & Charnigo, R. J. (2012). Negative Urgency, Distress Tolerance, and Substance Abuse Among College Students. Addictive Behaviors, 37(10), 1075-1083.
. Kotov, R., Gamez, W., Schmidt, F., Watson, D. (2010). Linking “big” personality traits to anxiety, depressive, and substance use disorders: A meta-analysis. Psychological Bulletin, 136 (5), 768-821.
. Kim, E., Namkoong, K., Ku, T., Kim, S. (2008). The relationship between online game addiction and aggression, self-control and narcissistic personality traits. European Psychiatry, 23 (3), 212-218.
. Walther, B., Morgenstern, M., Hanewinkel, R. (2012). Co-Occurrence of Addictive Behaviours: Personality Factors Related to Substance Use, Gambling and Computer Gaming. European Addiction Research, 18, 167-174.
. Kuntsche, E., Knibbe, R., Gmel, G., Engels, R. (2006). Who drinks and why? A review of socio-demographic personality, and contextual issues behind the drinking motives in young people. Addictive Behaviors, 31 (10), 1844-1857.
. Substance Abuse and Mental Health Services Administration. (2016). Adverse Childhood Experiences.
. National Institute on Drug Abuse. (2003). Preventing Drug Use among Children and Adolescents (In Brief).
. National Institute on Drug Abuse. (2014). Treatment Settings. In: Principles of Adolescent Substance Use Disorder Treatment: A Research-Based Guide.